If you’ve ever had to pick out flooring, you know it can be a huge investment. I once worked for an exhibit company. One of my clients was a tile manufacturer called Marazzi Tile. I lived near one of the VPs and he invited me into his home to see the tile he had installed. Tile ran through his home in every single room, including the bedrooms. It was something you might expect to see in Florida or Mexico, but not in Texas. He and his wife were thrilled because it was so easy to maintain, especially with dogs. The one thought that ran through my mind was what would happen when they went to sell the home, and the potential owner hated tile? The expense and the mess it would take to remove it and install something else was large. 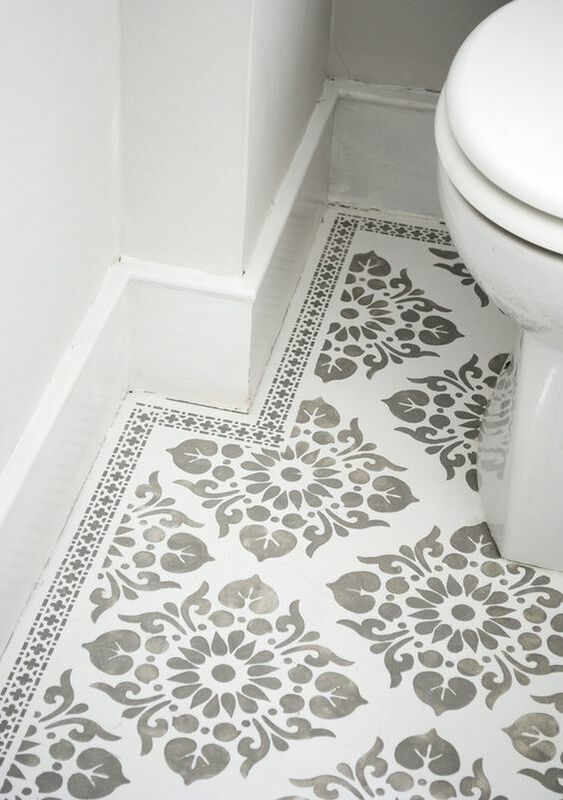 What if you can’t afford to redo the flooring? 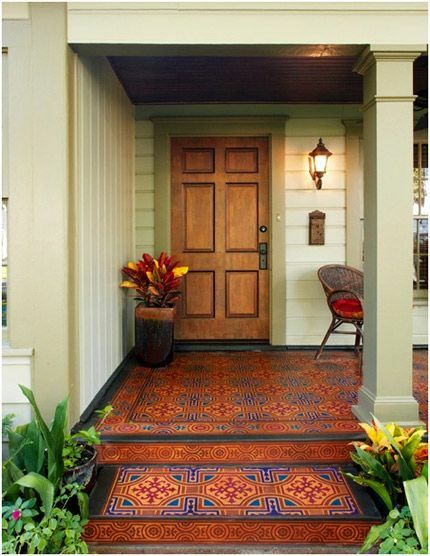 I gathered a number of ideas for you to consider from painted porches to painted interior floors. Wood, concrete or tile…it doesn’t matter. Each one is different and I hope they provide you with fun inspiration to get your thought flowing. What a fun way to welcome your guests. Now if this isn’t your palette of choice, adjust the colors to a color scheme you love. They used a stencil on the risers, along with the tread and floor…creating a full size rug that warm up this space and transforms it into an outdoor room you want to hang out in. 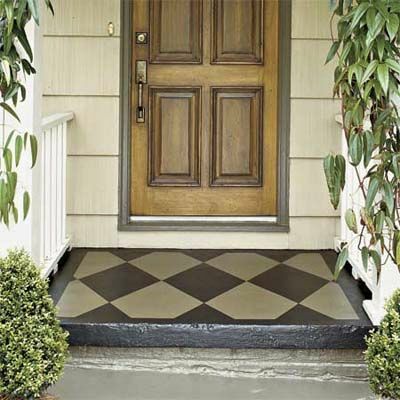 On a much smaller scale, this homeowner painted a single concrete stoop. This is easily achieved with painters tap and two colors of paint. 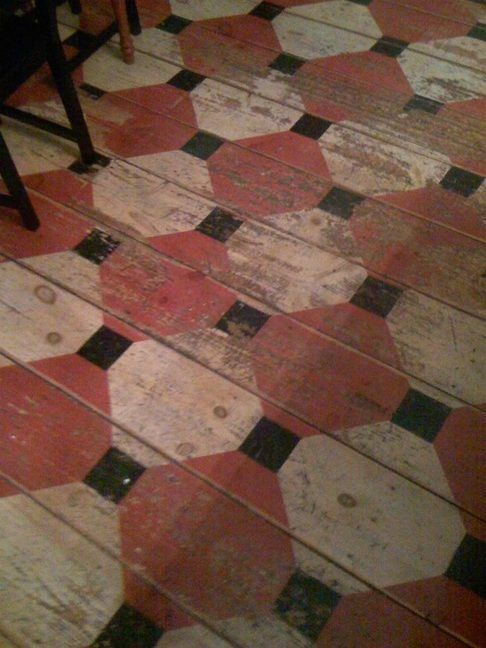 This rustic floor got a punch of color with the simple geometric pattern. Again, you could tape this off or find a stencil. If you paint it on and get the paint too heavy, you can wipe it off and or sand it to get this look. I’d start by dry brushing it to keep the paint light. 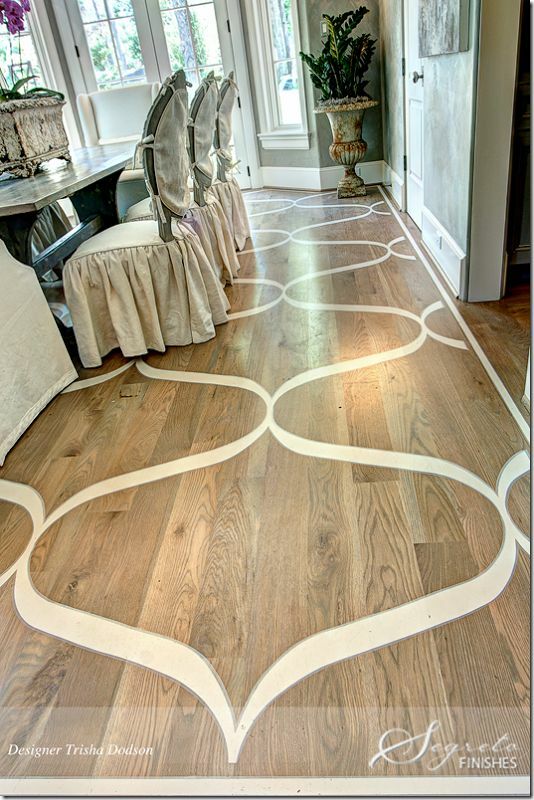 A little tape and imagination can take a big bland floor into something your guests will love! Personally, I love the modern geometric pattern mixed with traditional furnishings and moldings. The Anatolia Tile Stencil by Royal Design Studio is a large tile stencil design inspired by the Turkish region and the beautiful tiles found there. Whatever your color scheme is, you will definitely make a gorgeous statement. 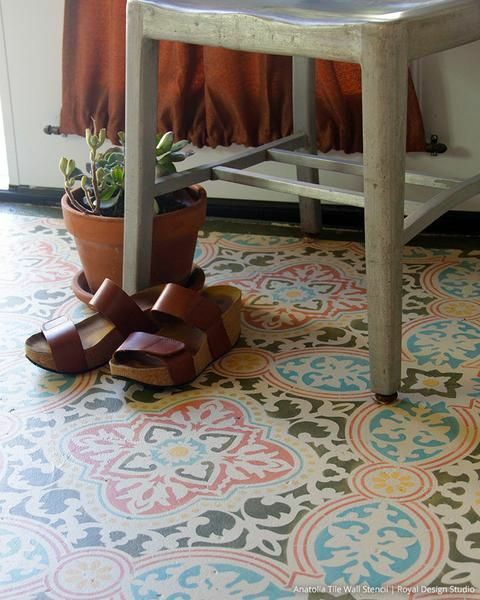 Think about transforming your concrete or wood floor, outdoor patio or deck, or maybe an accent wall. You could also paint or stain a picnic table with this. This transformation only cost the homeowner $10 for a quart of paint. 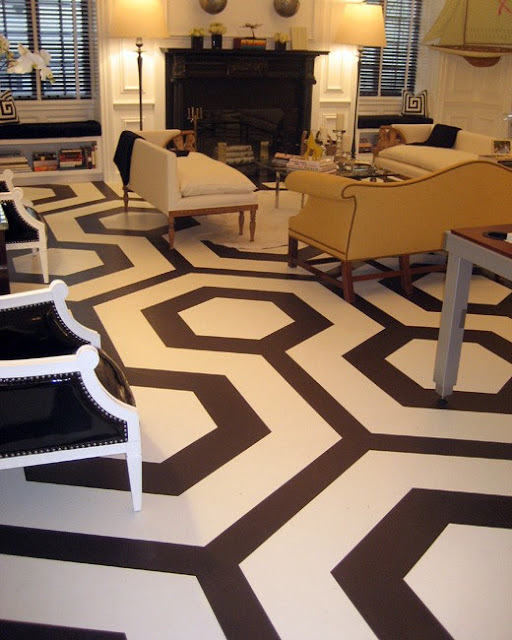 If you are painting your floor, always ask what type of paint the experts recommend for your room. They can guide you with the right one for durability and ease of cleanup. If you choose to seal it, be sure to ask for their recommendation as well. An oil based polyurethane will yellow over time and it’s not pretty. Make sure you get the right one. Stairs take up a lot of real estate in a home. If they’re not looking their best, you can do what Heather did. After researching their options and their budget, paint ended up being the winning solution. A simple painted “runner” helps to add visual interest. Vibrant! Free hand! Definitely a statement! She took this inspiration onto her walls as well. Wait till you see what she did insider her home. Ohhhhh the colors in this room! Love the bright white and yellow in this kitchen. The before was quite dark and mundane. The after...well it speaks for itself! I like how simple this is. The white diamonds take a long hallway and bring interest to it. It’s simple in design and yet very elegant. Another elegant option with a simple but LARGE pattern. With all this inspiration, it’s getting me a bit psyched to do my basement floor and stairs. While the basement is loaded with items, it would be stunning if we got it done. I might start with the stairs first as those will be much simpler to accomplish. All our best laid plans can come to nought…but I do hold them in my mind every time I’m down there. Which floor inspires you the most? Can you see yourself embracing one or more of these ideas? If yes, which ones? I can’t wait to hear! Remember, it’s only paint and you don’t have to be an expert. Just make sure you get the right materials and prep. If you make a mistake, it is easy to fix.